Here at Taste the Cracklin we offer an expert hog roast catering service, we can provide you with the perfect catering solution for any event. A hog roast is the perfect choice for both indoor and outdoor catering, with the option of informal buffets and formal sit down meals. When it comes to the perfect hog roast, Port St Mary is home to our expert team of hog roast caterers, who will ensure that you are served the very best meal. All of our food is sourced locally to bring you the tastiest and freshest food available on the day of your event. Our food is prepared and cooked on-site for you to see. No event is complete without the right catering, it is important that you take the time to find the catering that suits you best. We offer a range of different menus to suit every occasion, giving you a choice in the food served to suit your tastes. We always provide a vegetarian option and so there is no need to worry about what to serve your vegetarian guests. 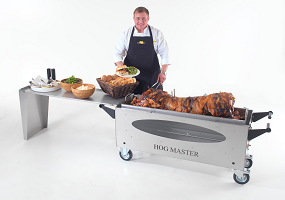 If you do not like pork, or would like a wider range of choice for your guests, we can also spit roast a range of meats on our machines to suit all tastes and requirements. We are flexible and will provide the menu you wish to use for your guests. When it comes to finding a hog roast in Port St Mary, we can offer you the best catering for any event. Just get in touch with us to talk through your requirements and we will work with you to try and ensure that you get the catering for your event, wedding or party that you envisioned.